The proper use of a groundcover can help you take care of problem areas that are hard to grow other plants in. You might have a shady area that grass won't grow in, or you might have a bank that you want to keep from eroding. In either case, there are lots of plants that you can use. One of our favorite maintenance-free groundcovers is Vinca. This perennial vine has dark green or variegated leaves and has lovely violet flowers in the spring. We have some that was planted on a shady slope in our yard when we moved here 30 years ago. It has never had any attention from us and is doing very well none the less. Vinca is readily available at most garden centers. 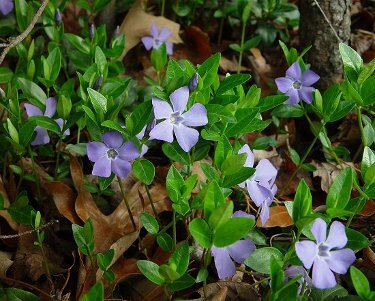 As mentioned, it comes in two forms , Vinca Minor and V. Major, which as their names imply are two different sizes. We did have some vinca major escape from some planters and it established itself very well before we caught it. V. major seems to be more invasive that it's smaller cousin. 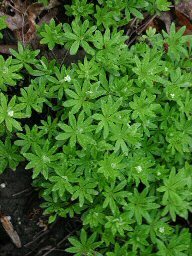 Another easy to maintain plant is Sweet Woodruff Galium odoratum. We've had this delightful plant in our yard for around twenty years since a friend gave us some, with the warning that it would take over. It's really pretty easy to keep in check, though. It transplants very easily and plants that we remove are easily planted in any bare spots. The picture below was taken in late April and it's just starting to bloom. In a few weeks, it will be covered with delicate white blossoms that smell of fresh mown hay. It's a perennial that's hardy to USDA hardiness zone 4 and prefers moist, well drained soil in the shade. Some other popular plants for this use are Ajuga, Allegheny Spurge, Japanese Pachysandra, English Ivy, and Lilies-of-the-Valley. Crown Vetch securigera varia, is a low-growing vine. It is native to Africa, Asia and Europe and is commonly used throughout the United States and Canada for erosion control and roadside planting. Crown Vetch is a hardy, low growing plant that is well suited to a sunny bank, where it will grow indefinitely with little maintenance. It has small clusters of 1/2-inch pink and white flowers from early summer to late fall. Its deep roots and fern-like leaves provide excellent erosion control where it is used as a ground cover. 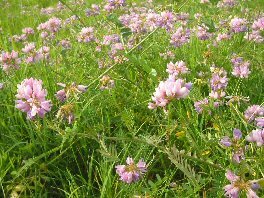 Crown vetch is toxic to horses because of the presence of nitro-glycosides. If consumed in large amounts, it can cause slow growth, paralysis, or even death.